Versatile and practical cycling. 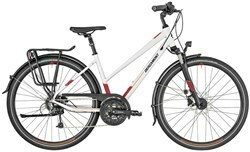 The Bergamont Vitess N8 FH is a women’s hybrid bike that features a step through frame with a comfortable upright cycling position. Shimano Nexus hub gears offer easy and reliable performance and require very little maintenance, so you can keep rolling smoothly mile after mile. 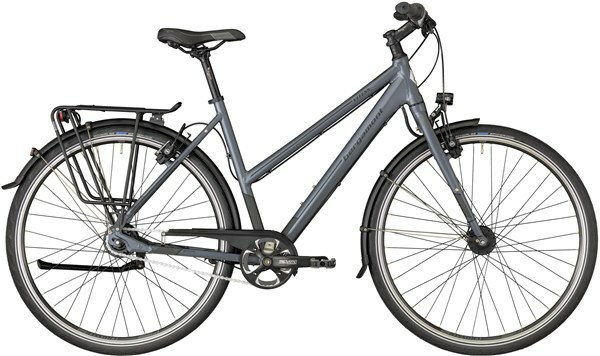 With dynamo lights, mudguards, luggage rack and kickstand ready fitted, the Vitess is ideal for commuting and light touring as well as practical urban cycling. 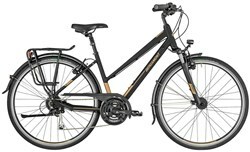 The bikes from the VITESS range help you escape from dreary everyday life, be it on your daily commute to work or on an extended tour. The newly developed, elegant aluminium frame with optimised geometric design uniquely combines dynamics and comfort, enabling a sporty and yet still maximum upright sitting position. The innovative ergonomics concept as well as the high-quality, safe and reliable attachments ensure unalloyed riding pleasure. 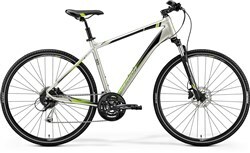 The elegantly integrated, light aluminium rigid fork gives the Vitess range a strictly sporty character with direct and agile steering.